This trip report was written while I was with Pan Am. 7. All items cleared except for wine glass, teaspoon and napkin. 9. “Golden Samovar” course – refer to comments. Overall time for sequence: approximately 2 hours, 30 minutes. For some unsuspecting passenger just riding an Alaska Airlines flight for the first time, there is a very pleasant surprise in store. The entire in-flight service combines a rustic “1890 Gold Rush” theme with an effective touch of Russian flavor. 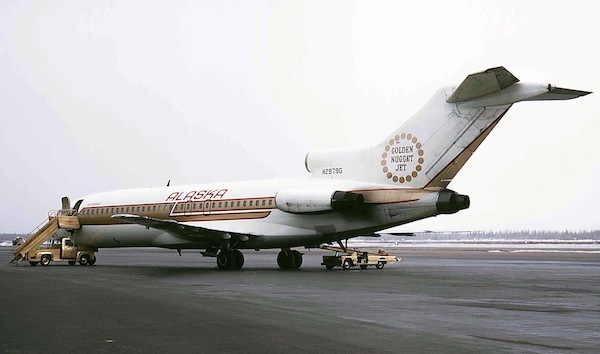 Alaska has recently begun charters to the Soviet Union, and is seeking scheduled flights as well. This, in addition to the close geographical proximity makes “Golden Samovar Service” a natural. I had the good fortune of sitting next to Mr. Robert Leghorn, Director of Flight Service for Alaska, who was kind enough to give me a blow-by-blow description as the service unfolded. The aircraft interior reflects the service very well. Cabin wall panels picture moose, paddle wheelers, seals, Native Alaskans, totem poles, fishermen and frontiersmen panning for gold. Cabin dividers are finished with wood paneling. Seat fabrics are deep red velvet. Matching valances with gold strand tassels are suspended between the overhead passenger service units. Stewardesses wear uniforms fashioned after Russian tunics. The meal itself was well timed and coordinated, although a few shortcuts compromised the service somewhat. For example, one stewardess refilled cocktail glasses with ice by scooping the ice up from the bucket (in the passenger’s presence) using another glass. Cocktails were served from the galley rather than from a cart setup. However, these items seemed minor in nature, especially when considering the time constraints imposed upon the crew. The combination of red tablecloths and gold (Oneida) silverware was impressive. Crystal salt and pepper shakers were topped with gold caps, and a “Golden Samovar Service” crest on the uniquely shaped wine glass completed the striking table setting. Chinaware was white, with a gold band. General food quality of the food was very good. The recipe for Russian black bread is authentic (as attested by Mr. Leghorn); generous amounts were provisioned – and consumed, I might add. Additional butter was also available in adequate amounts. The hors d’oeurves were good, and seemed to be readily accepted. Mr. Leghorn commented that caviar had been served for awhile then dropped, due to cost and less than anticipated appeal. The salad was fresh and tasty, and the Sour Cream dressing flavorful. I was served the steak entree (filet mignon), and received it in a medium state; slightly steamed but not to the extent that it lost any flavor. All items on the plate were reasonably hot, and portions were sufficient. Dessert seemed a bit anti-climatic. The Pie Odessa was a standard pecan variety, in a round tart form of approximately 3-4 inches in diameter, topped with whipped cream. Cordials were offered verbally, but not displayed. Printed menus are in the works, according to Mr. Leghorn, but not yet available. I believe they would further enhance the service, and prove a popular souvenir, hopefully in deference to the gold silverware, which is said to share top honors with the wine glasses for the highest attrition rate. Playing cards are to be offered for sale soon, at $1.00 per deck. They will feature the “Golden Samovar Service” theme, and should be an excellent way to cut costs, or even produce a small profit. TWA has similar plans, I understand. After dessert had been served, I discovered why the anticlimactic atmosphere had been allowed to exist. 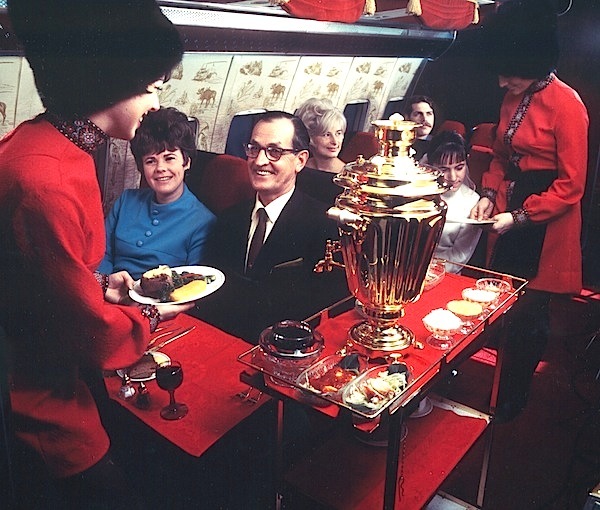 A stewardess announced, with considerable flair, that “Golden Samovar Service” was about to begin. She had no sooner completed the introduction than a cart appeared in the aisle. On it sat a genuine Russian Samovar, or, if you will, a teapot. Standing 26 inches high, the Samovar is gold-plated (the interior is nickel-plated), and matches the service logo. Dry ice is placed in a reservoir on top of the pot. Added water results in a pillar of vapor as the Samovar is wheeled down the aisle, truly a sight to behold. Russian tea was poured for those who wish to partake, and I noticed that a good majority accepted samples. The tea is poured from a spout on the side, into glass mugs as the cart moves from the front of the first class cabin, including the coach section. I personally enjoyed the tea, which had a spicy, not-too-sweet taste. The product itself is boarded dry in plastic pouches, and mixed with hot water in a coffee server, then poured into the Samovar. Our flight was about 30 minutes late leaving Anchorage, and the captain made several announcements about “making up” some of the tine; there were a number of connecting passengers attempting to catch flights out of Seattle. Just prior to arrival there, a further announcement was made, giving connecting flight information and gate assignments. In addition, ground personnel were on hand at the gate to assist close-connection passengers, who were obviously impressed. Crew attitude on the flight could only be described as excellent. All three stewardesses were very friendly and cordial. The fact that their boss was aboard may have influenced them, however the stewardesses on my earlier flight from Fairbanks to Anchorage were equally pleasant without the presence of Mr. Leghorn. In summary, I could not be more impressed with Alaska’s product. Considering the fact that Anchorage–Seattle is the airline’s longest route segment, “Golden Samovar Service” is quite a show-stopper. A good deal of imagination and hard work must have gone into its development, and I couldn’t help but chuckle when Mr. Leghorn commented that he was concerned about the competition Northwest Airlines would soon bring, with 747 equipment on this route. “We’re going to have to do something about our food service,” he said!